The business world of today has become more and more robust than ever before and has completely replaced the traditional phone systems of yesteryears. 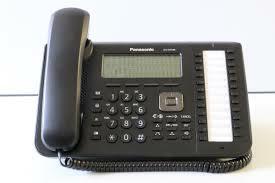 These Panasonic PABX Telephone systems have become completely mobile and they have scaled across to become the most flexible and at the same portable too and profusely aims for running the phone systems effectively through the internet systems and adhere to working on the internet protocol systems or the IP systems. The PABX Telephone systems being designed and developed by Panasonic has been perfectly suitable for small-to-medium-large scale businesses. It has turned up as a boon for them with reference to reducing the commercial implications with reference to their usages. The PABX phone systems are the ones which can be installed at the quickest possible time as most of these devices are just a plug-n-play types and predominantly implements the protocol systems for their connectivity. Anecdote: As the technology ecosystem keeps growing, the Panasonic PABX telephone systems have also scaled up as per the growing business demands and needs. In today’s context; these phone systems have been the vital device which has become the yardstick for a range of businesses. The PABX phone systems of today have expanded their horizons to support varied business demands and subsequently scaled combating with the latest technological advancements in the communication world. It goes without mentioning that in today’s rapidly changing world, the PABX systems play an important role in bringing about the finest digital connectivity in the organization which reduces the huge financial burden to the organization. Since it is a device which gets connected very easily over the internet, the company which invests on the PABX phone systems can get into the expansion plans by increasing the company horizons as a complete conglomerate company and still get a finest connectivity through PABX. The most prolific attribute of PABX systems is that of the email integration capabilities. With the PABX instrument in place; the business owner need not be worried about the kind of calls that are not being received upfront. The calls that are not answered are routed through the voice message systems which possibly get into the email format and being sent to the mail box. This way through the voice mail system; the business owners can revert back to the customer with much more ease. The PABX systems becomes an excellent medium of front-end communication as one can feed in the interactive voice in the system so that the customers can still be connected on a later date. How pansonic pabx phones are enhance your business communication.